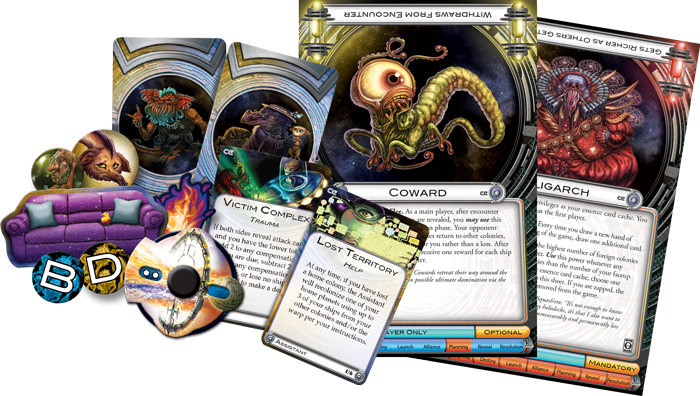 Cosmic Eons, an upcoming expansion for Cosmic Encounter, introduces new aliens with abilities unlike any you’ve dealt with so far, but it doesn’t stop there. This expansion features the Hidden Alliances variant, which enables you and your opponents to reveal simultaneously whose side you’re on. With this simple mechanical twist, Cosmic Eonspromises not just to open up a new part of the galaxy, but to change how you play the game. In Cosmic Encounter, you have to make friends if you want to establish as many colonies as possible. That doesn’t mean you should trust all your friends, or even stick with them for the whole game. The Hidden Alliances variant makes it possible to engage in all sorts of discussions about whose side to take in the encounter, then only reveal your true intentions at the possible last moment. 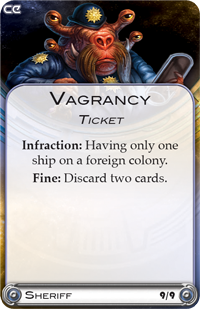 When using this variant (which works best with at least four players), you have an alliance dial that shows exactly how many ships you will commit to which side—if you want to get involved in the encounter at all. Once you and your opponents are finished discussing alliances and have determined what they want to do, you place their dials facedown until everyone has made a decision. Then, all at once, you reveal your plans. This simple adjustment creates lots of opportunities for persuasion, deceit, and betrayal, as well as adding another element of suspense to the game. Of course, not all the aliens in the galaxy are your friends. Some may be your enemies, and most will likely switch back and forth between the two. In Cosmic Eons you’ll discover a new genus of aliens that can keep closer tabs on (and has greater power over) both friends and enemies than any aliens before. These are the six aliens able to dole out Essence cards. Essence cards work slightly differently for each alien, but generally as an alien who has them you can, once per turn, give one out to another alien of your choice. The Essence card then affects the behavior of the alien that you gave it to, perhaps by preventing them from doing something, perhaps by encouraging them toward an action, perhaps by penalizing or rewarding something they’ve done. 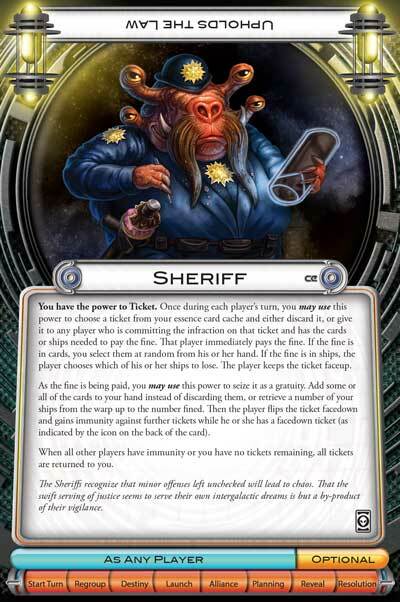 The Sheriff, for example, can hand out Tickets which force other players to pay fines for certain infractions, such as Loitering, Vagrancy, or Littering. Similarly, the Nanny can give a Consequence to an alien she thinks is likely to behave badly. 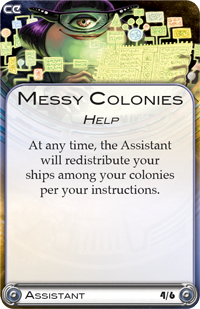 The Assistant earns rewards for helping out other players by, say, tidying up their Messy Colonies when they ask her to. Aliens with Essence cards are just a few of those who appear in Cosmic Eons. If you’d rather not hand out Tickets and just want everyone to get along, you can play the Bleeding Heart, who compels players to negotiate rather than fight. The Coward also doesn’t like fighting. He runs away from encounters and earns a reward for each ship the opposing player threatened the Coward with. Or you might be the Moocher, who doesn’t actually have any planets, so he is forced to camp out on couches across the galaxy.